Decades of expertise in cable technology give LAPP the expertise and capabilities to specify the right cable chain system for your application – from light duty nylon chain to steel or anything in between. LAPP has a track record of delivering high-quality components, optimum functionality and reliability. Lapp systems are rigorously-tested and delivered with a comprehensive system guarantee. With multiple manufacturing sites in Europe, Asia and the Americas we can support your needs wherever you are. With LAPP, you receive everything from one source: Ranging from individual pieces to whole series. 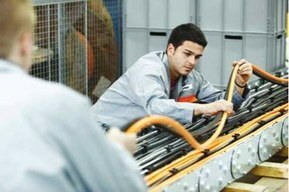 We design and manufacture connectivity components which allows us to provide innovative, reliable and quality chain solutions.